If you’ve ever traveled on a long car journey with small children, you will know that there comes a time when the questions about how long it’s going to take, and demands for food and a comfort break being to pepper the air. Children are never backward in coming forward with their ideas and wants, which is one of the joys of having a family. However, when your family includes a dog, unfortunately, your pet can’t speak up for himself during the journey, and so you have to plan ahead for him, or her. 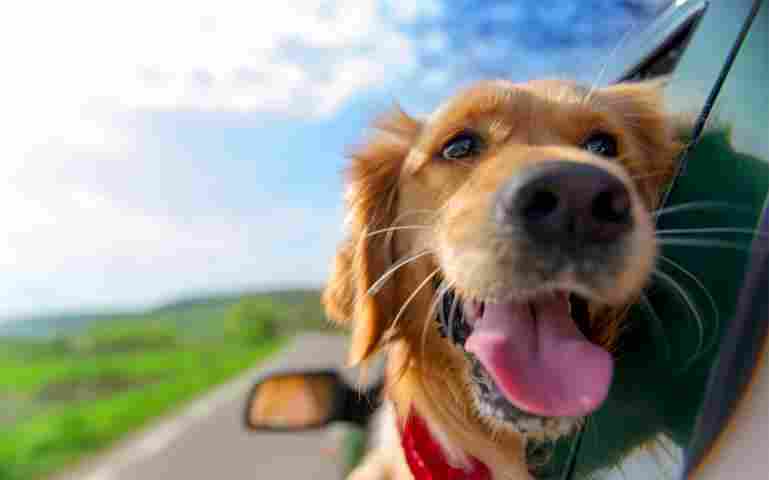 So here are some tips on how making a long car journey less stressful for your pet dog, will also make it less stressful for you as the owner and driver. 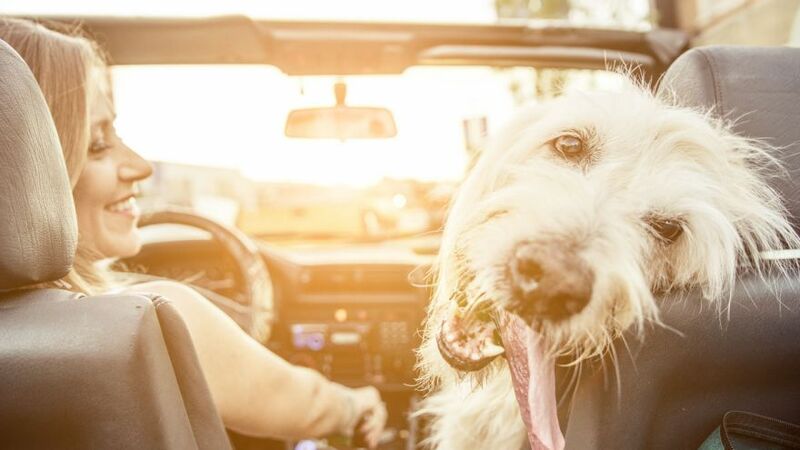 Let’s be honest about this, some dogs love to travel by car, and others hate it. 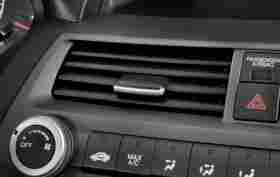 Both can make things more complicated for the driver and passengers. Some dogs will start howling and wailing as soon as the engine starts up, others will get so excited they want to jump around looking this way and that. None of this is good for the dog of the driver. So, it’s best to get your dog used to travel in a vehicle before thinking of taking them on a long car journey. A dog is never too young to start being trained to travel in a car. Introduce young puppies to your vehicle as soon as you can. Let them sniff around the place, so they get used to the smells of a motor vehicle. Take them on short journeys to the park for exercise, so they get used to traveling, and associate good things with a trip in a car. How are you going to restrain your dog in the car? It really isn’t safe to have a dog roaming around the cabin of a car without some form of restraint. For one thing, a dog moving about the cabin could easily distract the driver and cause an accident. Heaven forbids such a thing to happen, but a free dog inside the car could be severely injured if an accident were to occur. To keep your dog adequately restrained within the car, consider a pet cage, especially if your dog is a nervous traveler. A lot of people place it on the back seat of their car and make sure it is secure using the car’s seat belts. Your dog will also be close enough to be checked on and comforted if needed during the journey. If you own an estate car or maybe a larger SUV, how about putting in a grill between the back seats and the luggage compartment at the back. If the area is lined with blankets and it has its bed your dog can use the area, or at least part of it, as its nest. Best not to have any loose items such as feed bowls lying around as they can become dangerous missiles in case of an accident. If it’s nice and comforting most dogs will appreciate the space to sleep in as it is one way they combat motion sickness. Although not as secure as a pet cage, there are dog safety seats on the market. It will be more comfortable and safer for your dog should you have to maneuver the car suddenly. The dog safety seats attach between the front and back seats, creating a well in which your dog can snuggle with its favorite blanket. There are also car seat belts for dogs, which is what you will need if you don’t want your dog to be too confined or own a two-seater vehicle. The dog seat belt is attached to the seat belt already fitted to your vehicle. However, your dog should be wearing a harness around the body rather than a collar for it to work as safely as possible. In an emergency, there is less chance of harm coming to your dog if the seatbelt is attached to a harness rather than is neck collar. If you’re using a cage, let your dog see it, and sniff it, and get used to it before you embark upon your journey. Some owners suggest having a dog sleep in the cage for a couple of nights before a long trip, so it gets used to the space. Fill it with familiar things and smell, favorite blankets, and toys for example. Best not to give your dog squeaky toys as they can be very distracting on a long journey. Try to allow your dog to get into the cage by itself, and don’t force it. Luring it with treats is alright. It’s best to exercise your dog immediately before you embark on your long journey. 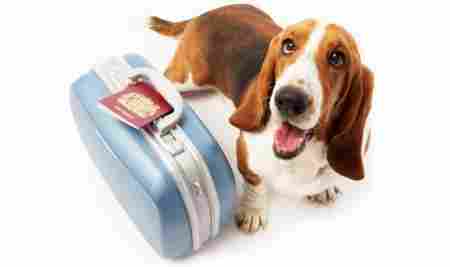 Get your dog nice and tired from lots of running around before he or she is put in the travel cage. Your dog may be upset being in the cage, but will be much less boisterous than a dog that is fully rested. Try not to feed your dog right before you leave on your car journey. The last thing you want is your dog to do its business inside the car while you’re traveling. It’s best to feed him or her a few hours before you embark, and when you do the exercise to tire them out, they can do what’s needed then. Pack enough dog supplies for the journey. If your dog is going to be cooped up inside a cage for a number of hours remember to have some water and a bowl, some food, and treats to reward them for doing an excellent job while traveling. You will probably need some poop bags for the times you stop for refreshment. Some dogs suffer from motion sickness, and if so you should consult a veterinarian on how best to medicate. The standard motion sickness tablets you and I take are not suitable for your dog, so best see the vet who might have other suggestions on how to overcome the travel sickness. If your dog is hyperactive, your veterinarian might suggest some medication to calm him or her down before traveling. Keep the collar on your dog at all times. It is better to be safe than sorry, as a long car journey can be stressful for a dog as it is for humans. No matter how well behaved he or she may be, getting out of the cage or the car your dog may just want to run away from you due to the stress. Once you are traveling, make sure you stop at least every couple of hours to let your dog have something to eat, and a little water, and give it a chance to run around a bit to tire themselves out. The absolute limit a dog can take without a break is four hours, so try not to keep he or she caged up in the vehicle for that length of time. If you are stopping close to the highway, make sure your dog is on a lead at ALL times, for his safety and those of other road users. Getting your dog to walk around a bit stops boredom setting in and allows them to stretch their legs. If the day is warm, never leave your dog inside a parked car. When you stop for refreshment, try and find a shaded spot to park your vehicle, and if you are going to keep your dog inside, lower the windows an inch or two so air can circulate. Without proper ventilation, dogs can get heatstroke and die very quickly. Better still try and give them a little exercise on their lead, and if you have to go inside for a meal at a restaurant find somewhere safe you can tie your dog up, and where you can keep an eye on them at all times. Keep an eye out for stress in your dog, if it is not acting as he or she would typically do. Avoid comforting your dog at this time, as to the dog it just reinforces that something is wrong. Once you successfully get to your destination don’t hesitate in taking your dog for a long walk, and give it lots of attention, and one of its favorite treats.